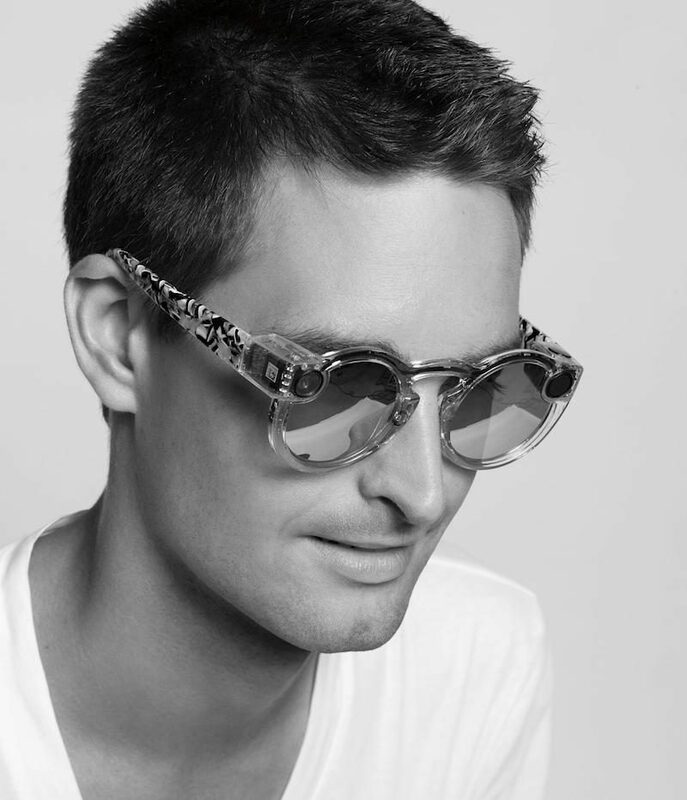 Snapchat has announced its first hardware product, a one-size-fits-all pair of sunglasses called Spectacles that can record 10 seconds of video at a time, reports The Wall Street Journal. The glasses will cost $130 and launch this fall in three colors: teal, black and coral. Video will sync wirelessly to a paired iPhone or other smartphone. The glasses record when you tap a button near the hinge, and each tap records 10 seconds of video footage from its 115-degree-angle lens. The lens was designed to be wider than smartphone cameras, more closely mirroring the natural view of human eyes. The video is recorded in a circular format, as Snapchat CEO Evan Spiegel argues that the square and rectangle form that photos and videos currently come in are a vestige of early photos being printed on paper. Snapchat has been developing Spectacles for years, and Spiegel has been testing the device himself for a year. He tells The WSJ that one of the advantages of Spectacles is not having to hold a smartphone in front of your face because it's "like a wall." Re-watching first-person footage is like reliving a memory, Spiegel argues. Spiegel refers to Spectacles as a "toy," and that the best use of it would be to wear it at an outdoor concert or barbecue "for kicks." The company is taking a slow approach to launch with limited distribution, similar to Google Glass. Spiegel says Snapchat wants to "figure out if it fits into people's lives and seeing how they like it." When asked why they made the product and decided to enter the hardware market, Spiegel said "because it's fun." Snapchat has also changed its company name to Snap, Inc as it has expanded its portfolio past its Snapchat app, similar to how Apple changed its name from Apple Computer. Spiegel thinks of the newly-dubbed Snap, Inc as a camera company rather than a social media company, The WSJ notes. He studied the early histories of Kodak and Polaroid and how they pitched portable cameras to the public. Spectacles gives Snap control of a physical camera, bypassing the smartphone cameras, like that of the iPhone, at the heart of Snapchat thus far. Spiegel hints to The WSJ that there could be "far-reaching implications" if Snap controlled the hardware its users take pictures and video with. I didn't think it could possibly get any dumber than Google Glass, and yet here we are! Reminds me of how everyone thought Google Glass was going to succeed. Checks date. Not April 1st. Comments that he checked date that it's not April 1st. Nearly comments that he comments, narrowly avoiding getting stuck in a recursive loop. While this is intended for the Snapchat generation, I can't help but imagine a more mainstream application for something like this. Google Glass was too early for its time but its time may be coming. A pair of glasses that records everything that you see while wearing them is something that could exist in an era of unlimited storage which cloud computing will inevitably lead to. Artificial intelligence able to recognize and index objects, moments and people would make it possible to search our lives for memories. "Show me that time when I first noticed my wife walking out of Macy's". There's a privacy concern that is gradually fading away as the generation that Spectacles was built for have grown up expecting cameras everywhere and not only not caring that they're being filmed but craving it. Older folks will hate it but the world will no longer be built for them. the 1990's called. they want their "mini" cameras back. sure the snapchat version isn't great, but when TC announces "apple Specs" in spring 2018, this will be the next market for wearables. Next logical step - beer goggles. Elton John called. He wants his glasses back.